The 2018 Burnished Gold Eagles Are Here! Ever since their debut in 2006, the Burnished $50 Gold Eagle has consistently been one of the scarcest Gold Eagles in the flock! Struck specifically for collectors by the West Point Mint, Burnished Gold Eagles are created from specially prepared 22-karat gold blanks that give each coin a distinctive smooth, matte-like surface, as well as razor-sharp details and blazing luster. No wonder Eagle fans around the world snap them up in short order every year they’re issued! But some are bound to be disappointed. Just 5,853 Burnished Gold Eagles were struck in 2017, compared the millions of their regular-issue counterparts. That’s why you can expect that this year’s 2018 –dated mintage of 10,000 coins will be in demand once again – particularly those bearing the coveted First Day of issue (FDI) designation. But now you can get a jump on the competition – and be first in line for 2018’s top-graded coins. Your 2018-W One-Ounce Burnished Gold American Eagle will come graded by the Professional Coin Grading Service (PCGS) to be in perfect Specimen-70 (SP70) condition, a distinction that means your perfectly-graded coin will have ZERO imperfections – showing all features and fields exactly as the engraver and mint intended! Your Burnished Gold Eagle will also be certified as a First Day of Issue (FDI) coin by PCGS – independent authentication that your coin was released by the mint during the premier day of the series' issue. Your coin will be sonically sealed in an acrylic case with a flag label – providing you the best in protection while giving you clear sightlines and perfect visual contrast for every beautiful detail. Don’t wait – order your 2018 Burnished Gold Eagles now! THE ULTIMATE SAINT-GAUDENS CREATION . 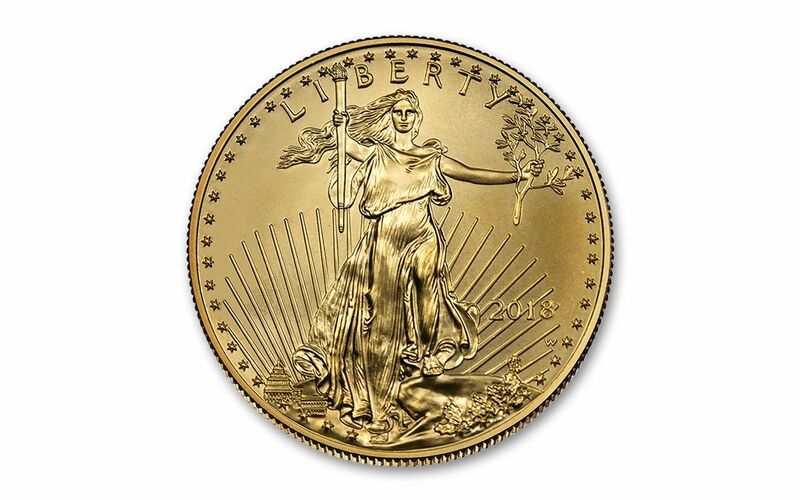 . . -- These One Ounce Gold Eagle Proofs exhibit a stunning design of Lady Liberty walking forward with focus and purpose, torch in one hand and olive branch in the other. Originally introduced on the famous 1907 $20 Double Eagle and born from collaboration between Augustus Saint-Gaudens and Theodore Roosevelt, this design reveals beautifully intricate details (like the U.S. Capitol building in the distance) with each viewing.
. . . PAIRED WITH A PATRIOTIC FAMILY! -- Featuring a male bald eagle carrying an olive branch to his family, sculptor Miley Busiek's design for the reverse continues to serve as a perfect modern companion to Saint-Gaudens' vision. EXPERTLY STRUCK IN HIGHLY PURE GOLD -- The craftspeople of West Point are known for their exceptional proof-minting artistry. Each hand-selected one ounce planchet of 91.67% pure gold is transformed into a work of art through multiple strikes from polished dies. In the end, each proof exhibits the Gold Eagle's time-honored designs with frosted, razor-sharp details that boldly rise from mirror-like fields. 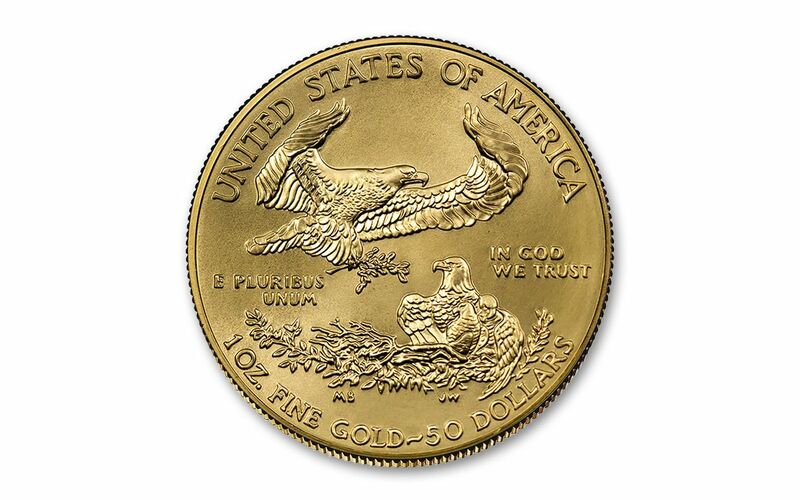 U.S. LEGAL TENDER -- Minted in gold mined in the United States with weight and content guaranteed by the U.S. government, each 2018 One-Ounce Gold Eagle Proof is $50 U.S. legal tender, as seen on the coin's reverse. 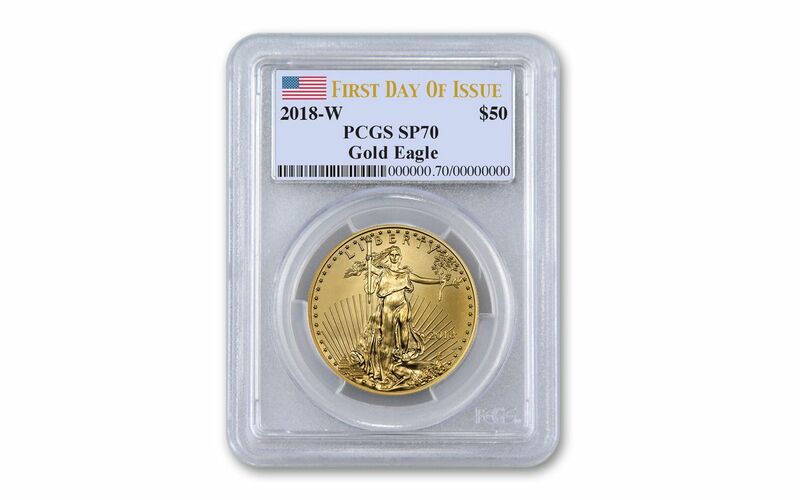 GRADED IN PERFECT UNCIRCULATED CONDITION – Your 2018-W One-Ounce Burnished Gold American Eagle will come graded by the Professional Coin Grading Service (PCGS) to be in perfect Specimen-70 (SP70) condition, a distinction that means your perfectly-graded coin will have ZERO imperfections – showing all features and fields exactly as the engraver and mint intended! KEY FIRST DAY OF ISSUE CERTIFICATION – Your Burnished Gold Eagle will be certified as a First Day of Issue (FDI) coin by PCGS – independent authentication that your coin was released by the mint during the premier day of the series' issue. Your coin will be sonically sealed in an acrylic case with a flag label – providing you the best in protection while giving you clear sightlines and perfect visual contrast for every beautiful detail. EXTREMELY LIMITED QUANTITIES – the U.S. Mint has set the edition limited for the 2018-W One-Ounce Burnished Gold American Eagle coins at just 10,000. Be first in line to get the 2018-W One-Ounce Burnished Gold American Eagle! 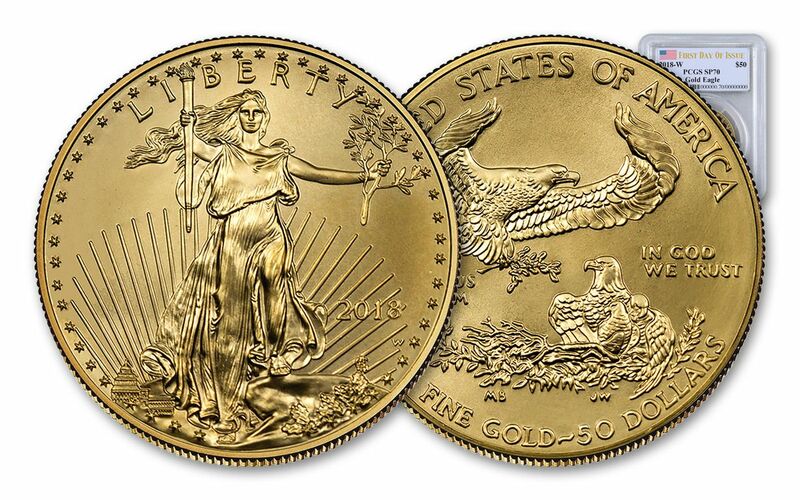 Only 10,000 Burnished $50 Gold Eagles will be struck so don’t wait – reserve yours now at GovMint.com!